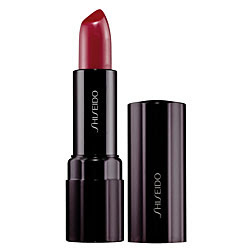 I am a huge fan of Shiseido Perfect Rouge lipsticks since I first tried Baby and urge everyone to go try them. I really hope to build my collection as I only own one (in Spiced Cream) right now!! At $25, they are pricier than say $14 MAC lipsticks but in my opinion, they are far more superior so I feel that extra $11 is worth it. On the bright side, they're cheaper than Givenchy, YSL, and Dior and in my experience, they're better. I cannot rave enough about these. I think they are a bit expensive (hey, I'd love it if they lowered the price) but they're definitely not super overpriced or anything like many designer or high end brands. If you're looking for an effortless lipstick with great pigmentation, moisture, lasting ability, and won't make your lips look crusty or flaky, go check them out. The only downside that I can find is that I wish they offered more shades and that they'd write the stinkin' color names on the bottom of the tubes instead of these number/letter combinations. For my reviews on these, click here and here. For swatches of most of the shades from the line, try here and here. Next up on my wishlist is Tourmaline, Ariel, Serenity, and possibly Bubblegum. Which Shiseido lippies would you like to try?